Wikileaks, which triggered an 'earthquake' in 2010 in world diplomacy, said on Monday it has begun the publication of more than five million emails to the American private intelligence and Stratfor strategic Analysis. The messages spread from July 2004 to December 2011. WikiLeaks founder Julian Assange was coy about the source of the more than five million emails from the Texas-based private intelligence firm which his secret-spilling site began to publish on Monday. "As a matter of policy we don't discuss sourcing or speculate on sources," Assange said at a press conference in London, where he is currently fighting extradition to Sweden over sexual assault allegations. He said WikiLeaks, "in its sourcing methodology, deliberately tries to not even know itself where its information comes from, because ultimately that is the strongest protection." But Anonymous, a loose-knit international movement of online activists, or "hacktivists," has repeatedly taken credit for hacking into Stratfor's computer servers and acknowledged on Monday giving the emails to WikiLeaks. "To clarify to all journalists - YES, #Anonymous gave the STRATFOR emails obtained in the 2011 LulzXmas hack to WikiLeaks," Anonymous said on one of its Twitter feeds, @YourAnonNews. Anonymous staged a cyberattack on Stratfor in December, shortly before Christmas, saying at the time that it was done for the "lulz" -- the laughs. Anonymous went on to explain Monday why they had handed over the apparently unencrypted emails taken from Stratfor to WikiLeaks. "Transparency, whether forced or voluntary, is necessary to understanding our world," the hackers said. WikiLeaks claimed the Stratfor emails, which date from July 2004 to December 2011, reveal the "private lies of private spies" and would uncover "everything from sinister spy tactics to an insider trading scheme with Goldman Sachs." WikiLeaks founder Julian Assange speaks during a press conference in central London. 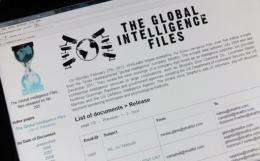 WikiLeaks on Monday began publishing a huge tranche of emails from US intelligence firm Stratfor in a move the anti-secrecy website said revealed the "private lies of private spies." Stratfor, for its part, denounced the theft of the emails as "a deplorable, unfortunate -- and illegal -- breach of privacy" and said it was an "attempt to silence and intimidate the company, and one we reject." 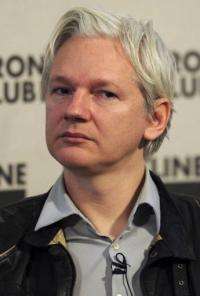 Members of Anonymous have long expressed support for WikiLeaks and for Assange, who before founding WikiLeaks drew attention for his exploits as a young hacker in his native Australia. In December 2010, Anonymous attacked the websites of Mastercard, PayPal, Visa and others for blocking donations to WikiLeaks after it began releasing thousands of classified US diplomatic cables. Anonymous launched distributed denial of service, or DDoS, attacks on the Mastercard, PayPal, Visa websites, temporarily knocking them offline but not causing any lasting damage, in an operation called "Avenge Assange." The attack on Stratfor was considerably more sophisticated and involved actual pilfering of personal and credit card information from Stratfor clients in addition to the trove of millions of emails. Anonymous has carried out a number of similar attacks in the past, publishing stolen material online at sites such as Pastebin or making it available for sharing as a bit torrent file. In the Stratfor case, however, Anonymous decided to team up with WikiLeaks. James Lewis, a cybersecurity expert at the Washington-based Center for Strategic and International Studies (CSIS), said he was not surprised by a partnership between WikiLeaks and Anonymous. "They have similar political agendas, sort of anti-government," Lewis told AFP. "They draw from a similar community so it's not a big surprise -- young semi-anarchist hackers." Lewis also downplayed the significance of the release of the Stratfor emails by WikiLeaks. For an organization that once trafficked in sensitive US government and military documents, the open-source intelligence Stratfor emails are "a step down" for WikiLeaks. he said. "It struck me more as a desperation thing," Lewis said. "Who's going to read five million emails? "I'm not sure how much bang for the buck WikiLeaks got for this." For Lewis, "the larger point is just how bad most people are when it comes to security." Breaching the Stratfor defenses "wasn't apparently a hard problem for these Anonymous guys," he said. "The password was the company name." First step will be an automaticaly generated relationship diagram. This will pretty quickly show who the central players are and whose emails are worth reading the most. After that it's crowdsourcing to filterthe interesting content - which Anonymous is pretty good at. the open-source intelligence Stratfor emails are "a step down" for WikiLeaks. How is this a step down? Since when does wikileaks have levels? Also, this: "The password was the company name." As with individuals, freedom ends where corporate profits begin. Haven't you heard? Corporations are people. Can't go around curtailing the freedom of the 'people'.